The Innovative Process Product Conversion (IPPC) Pallets series is the fast gaining a strong foothold in the arena of green products that are designed and produced to reduce carbon footprints. The pallets provide innovative packing solutions that helps customers reduce waste, thereby contributing to the reduction of carbon emissions. These extensively accepted environmentally-friendly packaging solutions enable customers to comply with international eco-friendly standards and regulations. Wastage is also reduced by re-engineering the packaging materials in various aspects such as shape, size, functionality and capacity etc. 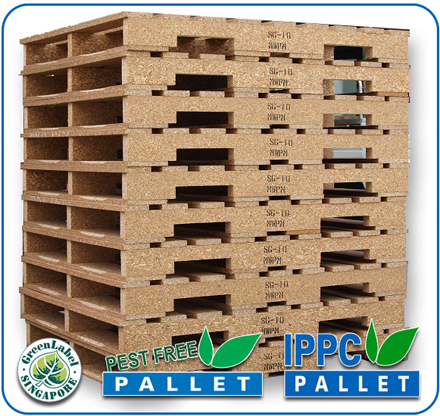 IPPC Pallets conform to the standards set by the International Plant Protection Convention – ISPM15. The pallets are functional and provide diverse advantages. 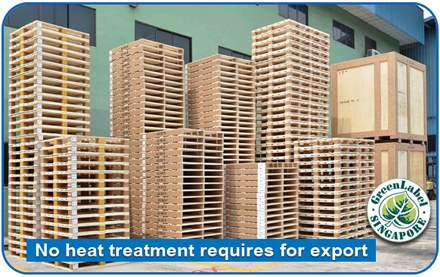 ISPM 15 describes phytosanitary measures that reduce the risk of introduction and spread of quarantine pests associated with the movement in international trade of wood packaging material made from raw wood. Wood packaging material covered by this standard includes dunnage. Clause 2.1. Exemptions; Engineered & process wood products such as corrugated, OSB, plywood, LVL, compress wood using glue, heat or pressure, or a combination thereof. These IPPC pallets or better known as Pest Free Pallets are available for do-it-yourself (DIY) and other customized sizes. See also Types Of Pallet. Plant : 1304 & 1305, Jalan Tun Mutahir 1 Industries Area Fase 2 Bandar Tenggara, 81000 Kulai, Johor. Office: 15-2, Jalan USJ 9/5Q, Subang Business Centre, 47620 UEP Subang Jaya, Selangor. Plo 19, Jalan Persiaran Teknologi, Taman Teknologi Johor, 81400 Senai, Johor.